Sometimes I create a recipe and get it right the first time out. There's no need to make it again and tweak the recipe before I'm willing to share it with you. And sometimes I have to tweak the recipe A LOT. Several months ago, I mentioned on my Facebook page that I was devising an MSPI-friendly spaghettios recipe. Well, it's taken me this long to get it right, but here it is! My kids absolutely adore this recipe. My oldest daughter, who has actually had the real thing from the can, says my version is so much better. Yay! That makes this mama happy! Stir together in a medium saucepan all the ingredients, except for the pasta and water. Bring the tomato mixture to a boil and stir in the pasta. Turn the heat down and cook the pasta as it simmers, stirring often to keep the pasta from sticking to the bottom of the pan. Continue to cook and stir the mixture until the pasta is tender. (The time will vary depending on the size and shape of the pasta but will likely be much longer than indicated on the pasta’s package.) Add a splash of water, as necessary, to keep the sauce from becoming too dry. (I probably added about 1 cup of water by the time I was finished.) Adjust seasoning to taste – including a bit of sugar, if you prefer your sauce on the sweeter side. Note: Nutritional yeast is not necessary in this recipe, but it helps replace the flavor of cheese. It’s also a nutritional powerhouse, so it’s a great addition to your diet. You can find it at most health food stores or online. GF: For a gluten-free option, use a small gluten-free pasta. If you can't find one that is satisfactory, try using a gluten-free spaghetti noodle and breaking it into small pieces before cooking. Link Love: I'm sharing this recipe over at Allergy Free Wednesdays. You are my hero!!! :) My children will be singing your praises for a LONG time. Made this last night, it was great. It did make a lot more than I was anticipating. Do you think it would freeze okay? I don't see why you shouldn't be able to freeze it. However, when you go to eat it, make sure it is completely defrosted (preferably in the fridge for 24 hours) before reheating. Otherwise, your pasta will turn to mush. Yuck! Wow! This looks yummmy. I used to serve these to my kids. Since I went whole foods I haven't bought any for the grand kids. NOw I can make them good for you spaghettios. Thank you for the recipe. A question: Could I use whole milk or would it change the recipe? As long as you don't have a dairy allergy/intolerance, using regular whole milk shouldn't be a problem at all. In fact, it'll probably turn out even creamier! Lucky you! Do you think almond milk would work? Don't want this to sound weird but I totally heart you! My kids will love this! I will make it gluten free also! YIPPEE! Made this using De Boles Gluten-Free tubettini (corn pasta from Whole Foods) for my toddler son who has multiple food allergies. At first when it was done cooking I wasn't impressed, there was kind of an odd taste from either the corn pasta or the rice milk (I still am not used to the flavor of these ingredients in my cooking!). But after adding some cane sugar and salt and letting it mellow a bit, I was surprised to find that it ended up tasting pretty much just like the classic from a can (in a good way). Unfortunately my son wasn't impressed with my efforts, he just tossed it on the floor, but he doesn't like trying new foods; I saved several portions in the freezer to try on him again later. I am able to have dairy, so grating some Parmesan on my portion made a good guilty pleasure lunch for me. Anyway, don't skip the seasoning to taste at the end, it makes all the difference! Very good recipe. Has become a staple for easy side or meal. I have added ground beef and basil and my son loves that also... thank you for the recipe! Congrats! Your recipe made it on my "Recipes Tried: Vegan" board on Pinterest with a rating of 4/5! And thank you so much for posting this delicious recipe for me to try with my family! I was wondering why you cook the pasta in the sauce. It seems like it would be quicker and easier to cook the pasta separate and add to the sauce. Good question, Dana. 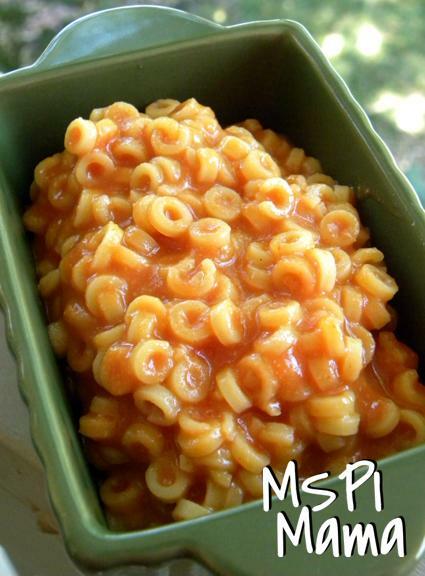 By cooking the pasta in the sauce, you mimic the texture and creaminess of the canned spaghettios. It's really the secret to getting the recipe right and I highly recommend not skipping this step. Hope you enjoy it! I made this tonight for my mspi dd and she loved it! I normally buy the kidfresh ones and she gobbled this one up as well as she does kidfresh. Next time I think I will preplan and add in some hidden veggies! Thanks for the recipe. Thanks for a great recipe! Unfortunately my MSPI (and picky) kiddo was unimpressed, but my younger no restrictions kid gobbled it up! I never did like the original from a can, but I actually enjoyed this enough to join them. Did feel a little bland to me (but plenty sweet) so I added just a touch of yellow mustard and that did the trick for my tastes. Thanks again for this and all your recipes! I feel like I'm learning to cook all over again since we diagnosed our dd's problem. You are such a life saver!